These three images were taken this past September during a hike that Steve and I took around the Heron Pond area of RMBS. 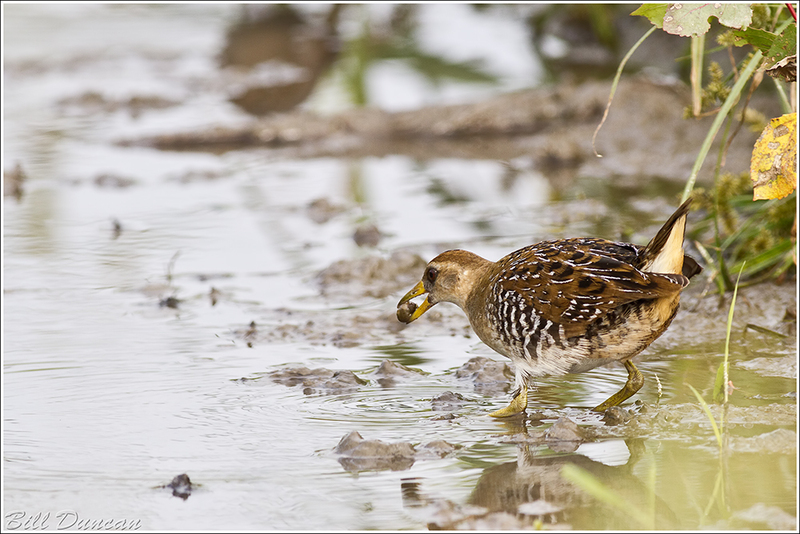 By far the most commonly come across rail in this part of the world, the Sora, fills the perfect role of chicken in the fresh-water marshes. I never get tired of watching these guys wade out into shallow open waters to feed, ready to sprint back into the cover of the marsh plants at the least sign of danger. At just the peak of migration, I have been fortunate to see nearly 100 of these birds at Heron Pond at a given time. 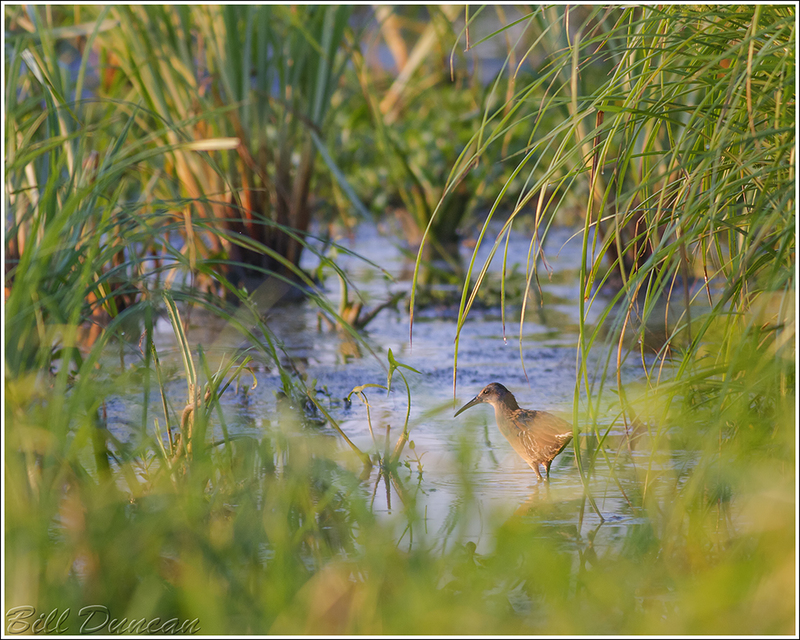 In the field, the brief views I was fortunate enough to get suggested to me this was a Virginia Rail. The Virginia is only about half the size of the King and this obvious difference should usually make the identification quite easy. Unfortunately my brief, distant and mostly obscured view of this bird did not allow me to get a good estimate on the bird’s size. Once back home with the photo and field guides open I began to doubt my original ID call. I listed as many reasons to feel KIRA as VIRA. I quickly realized I needed help and rushed the photo and my thoughts to the three wise men of the birding community I knew would love the challenge. The single photo was less than the smoking gun I was hoping it was. All three agreed it was most-likely a King Rail, but there is still room for doubt. Although a photo of a Virginia Rail would have added a new species to my bird-photo-life-list it always makes me happy to find and watch a bird of conservation concern, as is the King. 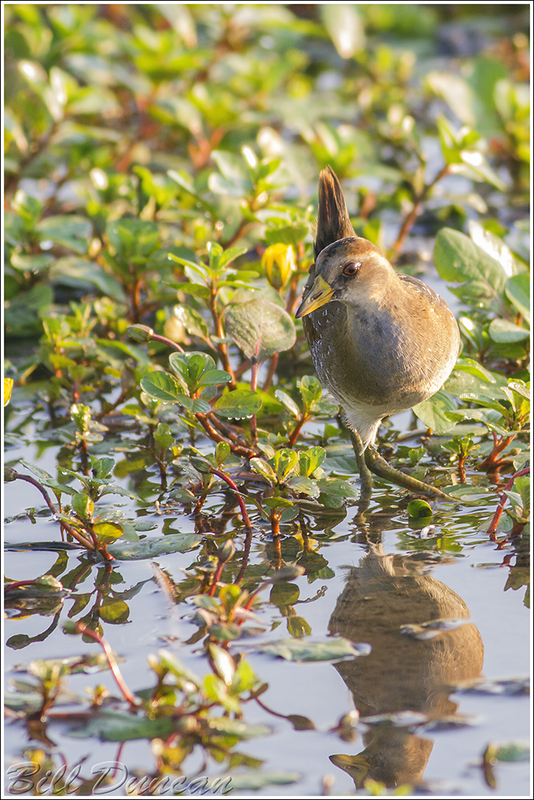 You can see in this “bird in habitat” photo just the sort of habitat that rails and other waders need. 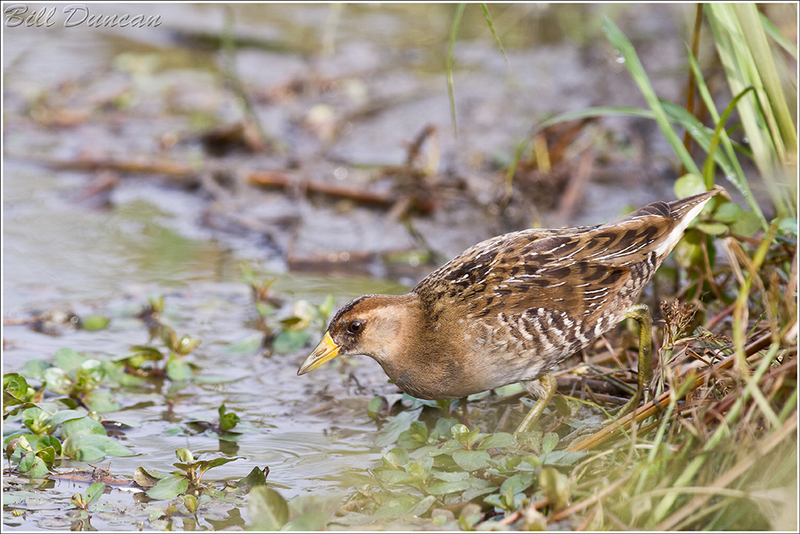 Rails love to be in water about up to their knees with plenty of vegetation to use for cover. Most shorebirds like the mud, while larger waterfowl, obviously like a little more water. Heron Pond at RMBS is being managed to provide the habitat these groups of birds need. Check out a few images of young KIRA I took a while ago. This post/photo is dedicated to Paul Bauer, master birder, bird photographer, and steward – a responsible agent in the development and management of Heron Pond and other features of Riverlands Migratory Bird Sanctuary. Thank you, Paul, for leaving something worthwhile. 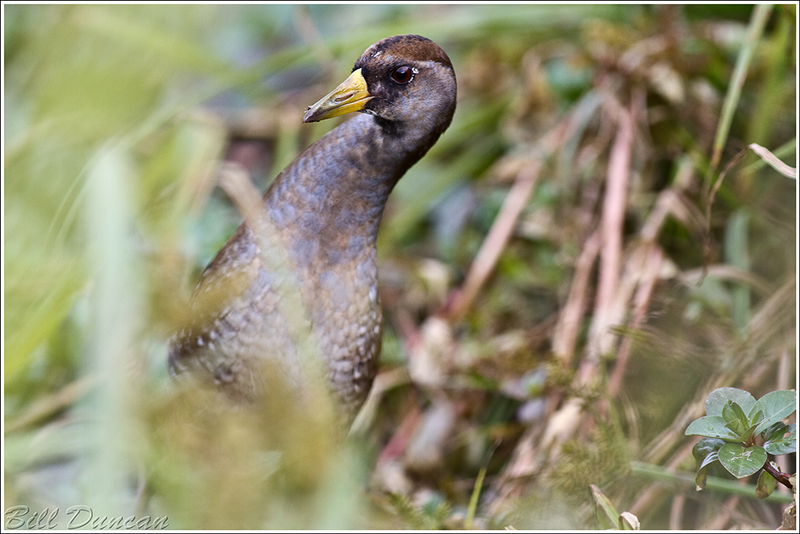 The Sora, or as I like to call them the Marsh Chicken is a small but quite abundant rail. They definitely are one of the easier to view rails to be found during migration, but I found out how common they can be during a magical morning spent recently at my usual haunt at RMBS. Arriving just before dawn I wandered the slow hike to a nice spot to watch the marsh of Heron Pond while waiting for the ol’ Sumatra brew to kick in. I had the entire place to myself for most of the next two hours, standing still and counting the birds. Besides being reminiscent of a chicken, I think Pete Dunn’s description of their bill as “candy-corn-shaped” to be quite fitting and a good field mark for identification. These guys are often vocal and at certain times of the year their whinny-type calls and grunts can be heard all day long. Being a rail these guys are definitely timid and spend a good amount of time hidden within the vegetation. However, I have found these guys to be much more willing to spend time on the open mud in search of food, making a run back to the greenery at the first sign of trouble. My total count for this particular morning was 62 birds! Looking around the pond it seems that you would not be able to run through the vegetation without kicking one of these guys with every step. Standing relatively still allowed me to catch this guy in a photo probably no more than 15 feet from where I stood.